The story of the card seen round the world finally came to end several days ago on eBay. 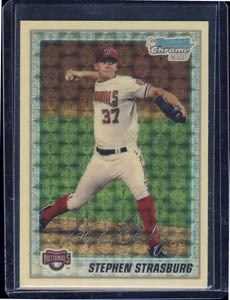 The final closing price of the 2010 Bowman Chrome Prospects Superfractor Stephen Strasburg ended up reaching $16,403, in the process turning a baseball card into a cultural phenomem and quite possibly ushering in a new era for baseball cards. $16,403 will be the immortal number most associated with Strasburg Superfractor. But, perhaps the number that tells an even more intriguing story is the number of people who watched the story unfold, 10,740! A number that is not only unprecidented for a baseball card auction, but for any auction period. When the auction begin a little over 11 days ago, it was a hobby story. As the clocked ticked down and the bids boosted the auction action, the simple story of a great American baseball card captured the imagination of a world. It had all the ingredients of a great story, drama, intrigue, hope, fear, consequence, and a cardboard protagonist. For 10 days in the month of May, a world tuned in to see how much a single piece of rectangular piece of cardboard could be worth. Though the auction finished without the last second bidding frenzy synonymous with eBay card auctions, watchers walked away knowing one thing, sports cards are not only worth more than the cardboard they are printed on, they can hang with heavy hitting finite committees such as jewelry, gold, and stock. As time erodes, the story of the Strasburg Superfractor will either be remembered or forgotten. Is it the first chapter in the book of the great baseball card comeback? Or was it merely the last paragraph in a short story? As an optimist, I would like to believe that the story has just begun, that 10 years from now sports cards will have a fan base as large and diverse as the cards themselves.